Pakistan says it has killed more than 100 militants in a security crackdown following Thursday's attack on a shrine that left at least 80 people dead. 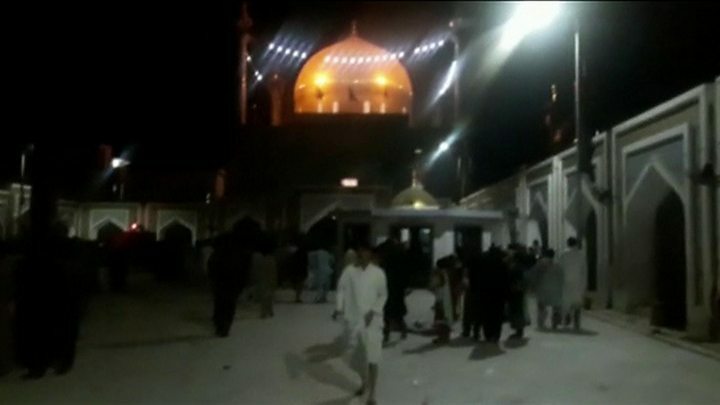 A suicide bomber blew himself up among devotees at the Sufi shrine in the town of Sehwan. Pakistan has reacted with raids across the country and by lashing out at Afghanistan which it accuses of tolerating militant sanctuaries. So-called Islamic State said it had carried out the attack. It was the latest in a string of bombings by the jihadist group. In response, some 18 militants were killed in southern Sindh province, where the Sufi shrine is located, and another 13 in the north-west, officials said. It is unclear where the other alleged terrorists were killed. Border crossings with Afghanistan have been closed and rockets have been fired into two Afghan provinces. 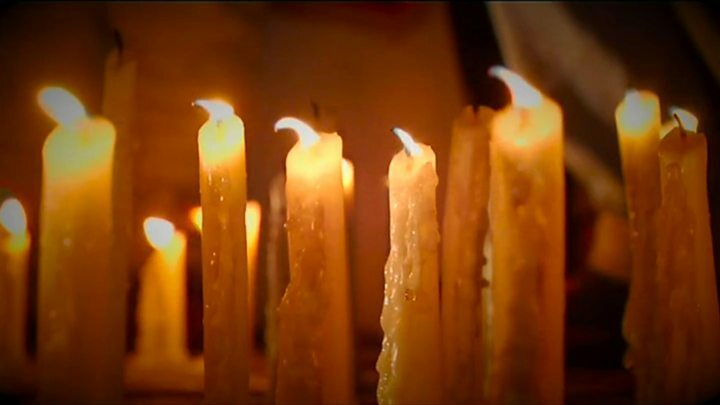 Funerals for victims have been taking place on Friday and the Sindh provincial government has announced three days of mourning. Some 250 people were also wounded in the attack. Media captionIs terror returning to Pakistan? Prime Minister Nawaz Sharif condemned the bombing and immediately vowed to track down those behind it. Pakistan's army chief, Gen Qamar Javed Bajwa, said in a statement: "Each drop of the nation's blood shall be avenged, and avenged immediately. No more restraint for anyone." Armed forces spokesman Maj Gen Asif Ghafoor said more than "100 terrorists" were killed and many others arrested in 24 hours as part of operations across the country, including Punjab province. He said more details would be shared later. Correspondents say crackdowns of this type are a regular response from the state following a major militant attack. However the number of militants the army is claiming to have killed this time is higher than normal, says the BBC's M Ilyas Khan in Islamabad. The military needs to offset the impression that it is losing the war against militants, he adds. Earlier, the paramilitary Rangers said they had targeted militants overnight in Sindh, while police said further raids were carried out in Khyber Pakhtunkhwa in the north-west. The army also summoned officials from the Afghan embassy to its headquarters in Rawalpindi, protesting that Afghan soil was being used as a base for militants to carry out attacks in Pakistan. The army said it handed over a list containing the names of 76 "most wanted terrorists", insisting that Afghanistan take immediate action against them. Afghan President Ashraf Ghani on Friday condemned the shrine attack, saying: "Terrorists once again proved that they have no respect for Islamic values." Devotees continued to flock to the shrine of Sufi saint Lal Shahbaz Qalandar in Sehwan on Friday. The mood was defiant, with the customary naqqara (drum beating) taking place at daybreak as usual, and worshippers vowing to hold their routine dhamal (sacred dance) in the evening. There were also angry scenes, with some worshippers complaining to police that they had not provided enough security despite previous threats to the shrine. The shrine attack was the most deadly in a series of militant attacks since Sunday that have killed more than 100 people across Pakistan, including civilians, police and soldiers. A number of militants, especially many members of the Pakistani Taliban group (TTP), moved to Afghanistan after the Pakistani military's operation in North Waziristan in 2014. They are mostly based in eastern Afghanistan in areas considered to be outside the Afghan government's control. Some of these militants later joined the Islamic State group. The Afghan government insists it has been targeting them and has killed several Pakistani Taliban commanders over the past two years. When an attack takes place in Pakistan, officials generally point the finger at Afghanistan. Pakistanis blame elements in the Afghan intelligence agency and India's Research and Analysis Wing (RAW) for supporting militants who carry out attacks against Pakistan. Afghan officials view this as hypocrisy, accusing Pakistan of discriminating between "good" and "bad" militants. They accuse Pakistan of allowing on its soil militant groups that attack Afghanistan and India. They also point to the presence and killing of a number of top-ranked militant leaders, including Osama Bin Laden and the Afghan Taliban leader Mullah Akhtar Mansour, in US strikes in Pakistan. The "blame game" has become a norm as the countries accuse each other of using militant groups as proxies. The border closure and fresh allegations by Pakistan will further erode the little trust that exists between the two governments.